Let’s start at the beginning, with the end of ComicsAlliance. One of my favourite sites closed down on 1 April – see this Twitter thread for a taste of what reading, and latterly writing for, CA meant to me – but I was at least able to contribute to its final days. “It holds together the comic, which moves at a breakneck pace. 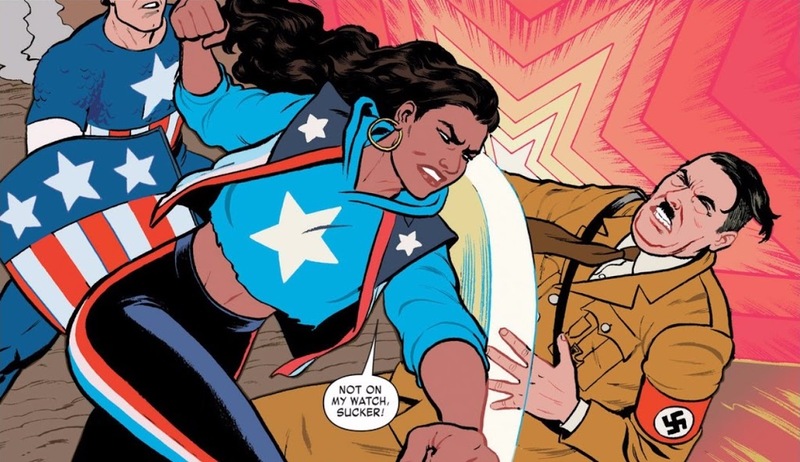 As much as I’m buying the next issue to follow the continuing story of one of my favourite characters, the question that will really keep me coming back is: What is America wearing this month? It felt like a pretty appropriate way to wrap up my time at ComicsAlliance. Starting the month as a comics criticism rōnin, I turned to the one venue I still had for writing about the ol’ funnybooks: Tim + Alex Get TWATD, the Wicked + Divine blog I co-run with Tim “a Baal in the streets, a Sahkmet in the sheets” Maytom. Given that the blog has been running for nearly three years, it’s way past time we put the focus on Matt Wilson’s brilliant (in the literal sense) colours. So that’s what I did. “There are gods whose powers are specifically tied to a colour combination, like Baal’s white and purple lightning, or palette, like Dionysus’ rave neons and fluorescents. But whoever’s doing it, when shits gets supernatural – whether on stage or in battle – Wilson brings the fireworks. 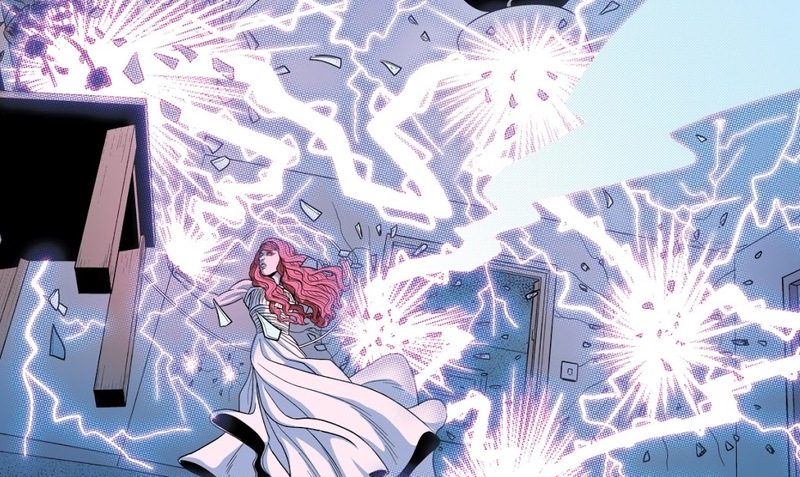 This is from my overview of Wilson’s work on WicDiv, as well as Marvel’s Mighty Thor, looking at some of the things that make his colouring exceptional. I followed it up with a smaller blog about the scene that first inspired me to write about Wilson – Woden’s descent into hell in issue #25. Away from comics, I spent most of February and March working on a relaunch of Mobile Marketing Magazine. One of the parts I’m most happy with is the launch of Viewpoint, a rotating weekly column that passes writing duties between myself, the aforementioned Tim Maytom, and our founder/editor/all-round boss David Murphy. The project has produced some of the best writing I think we’ve ever had on the site. For me personally, it’s been a chance to flex muscles that I rarely get to at Mobile Marketing: being opinionated, telling anecdotes, pulling out all the tricks I normally save for blogging. It’s been great fun. My Viewpoint from the actual month of April is about Augmented Reality, and what happens to technology that’s hyped as the next big thing. But the one I suspect you’ll enjoy most is this story about Imi’s wedding dress, and the broken system of online reviews. “Google reviews have the user’s profile attached. Which meant the shop – still in possession of her wedding dress – was able to identify which customer had left this rating. Which led to a member of staff ringing the mobile number she’d left with the shop, to demand an explanation for this three-star rating. With her dress essentially being held hostage, my fiancée decided the best course of action was to deny all knowledge, and claim it must have been an errant thumb on her touchscreen. And, finally, back to comics. One of the few good things about ComicsAlliance closing has been seeing other websites open their doors, and its writers find homes elsewhere. Including – to be predictably self-serving – me! I got the chance to write for comics juggernaut CBR for the first time, echoing my first piece for ComicsAlliance with a feature about the hallwayfight scenes in Netflix’s Defenders shows. An even bigger surprise, though, was getting to write for Polygon – best known as a games website, with one of the most thorough editorial policies in the biz. With DC’s Batman and Flash comics revisiting Watchmen, I wrote about the nine-panel grid, one of the most interesting parts of that book’s 30-year legacy. “Every comics page is a succession of frozen instants, but they could be seconds or minutes apart. The density of a nine-panel grid allows for a consistent rhythm. The smallest movement, of Batman turning over the smiley badge in his hand, can be broken into parts, each like a frame of celluloid. Not only is Polygon a great website, but it’s recently introduced Buzzfeed-style image swiping tools, which let you jump back and forth between the original pages and my annotated versions. Whoosh! It’s the closest my writing has even come to having its own special effects. Go and check it out.